What’s the difference between a “carousel” and a “slideshow” in Facebook Ads Manager? When is a video ad more effective than a single image ad? 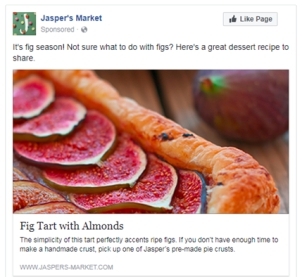 If you’ve been following our step-by-step guide to creating Facebook ad campaigns, you probably have a few questions about the format for your ad and how it will look to your audience. We’re here to help you break it down and get answers. Below, our social media advertising team talks about the benefits of each format, as well as how to use them to create an ad that captures the attention of your target audience. Carousel ads are great because they allow you to present a single ad featuring multiple images and headlines that users can scroll or swipe through. The format gives you a lot of options, and it helps you create something more substantial to capture the attention of your target audience. It’s also great because you’ll get information about which images perform the best. With that data, you can create more ads with similar images, or you can swap out images that aren’t performing well. Keep in mind that, no matter what ad format you choose, each of your images should be compelling and include minimal overlay text. See how the amount of text in your ad image will impact the reach of your ad. Single-image ads are the simplest kind of ad that you can create, but they can still be powerful. They feature a single, still image and your text, as well as a link back to your target page. You can use attention-grabbing content to get your point across briefly and to spur your audience to take action—such as clicking through to a landing page on your website with more comprehensive information. 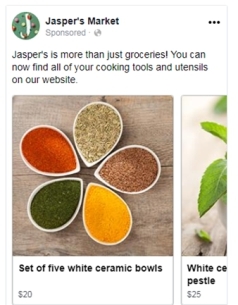 You can only use one image, so make sure you choose a compelling, high-quality image that is relevant to your ad text and in line with Facebook’s policies for ads. Video ads can get a lot of information across in a short amount of time, so they’re great for showing office culture, explaining complicated concepts, or promoting events. Your audience can see and hear your brand in action, and it’s a nice option for people—especially mobile users—who might prefer video over text. Desktop in feed and desktop player: For desktop in feed, vertical video will continue to be letter-boxed to 1:1. For desktop player, vertical video will be 9:16 with no black bar letter-boxing. Slideshow ads are a fast and easy way to create more complex or comprehensive media ads for Facebook audiences. For example, you could put together video slides, image slides, and text to create a looping how-to guide for car accident victims. Slideshow ads are a good way to present multiple videos and images to educate your audience, while still being friendly to people with slower connection speeds. Slideshow ads are a little more involved than the other three formats available, and they are really best suited for advanced Ads Manager users. 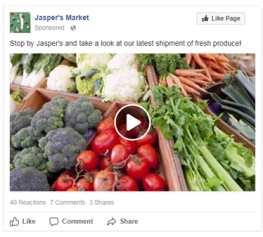 If you’re interested in learning more, we recommend that you take a look at Facebook’s slideshow ad guide for businesses. Facebook is always updating its algorithm and advertising options, so try not to be frustrated if you’re having trouble creating ads or accomplishing your goals. Reach out to our social media marketing experts today, or listen to our Facebook Ads 101 podcast for more tips, tricks, and guidance.